La Garoupe is an absolutely stunning holiday villa, perfect for 8 people - this holiday home has a perfect view of the Mediterranean, as well as direct access to the beach from the property. With incredible decor, attention to detail and the most wonderful location, this villa can sleep up to 8 people in 4 bedrooms. Can accept 4 extra children making a total of 12 people. Complete with all facilities, walking distance to everything and fully air-conditioned; this is the place for you. Small pets welcome. Perfect venue for weddings and events up to 200 guests. La Garoupe is an absolute paradise - white-washed terraces, walls and exteriors overlooking a panoramic view of the Mediterranean; direct beach access from the property and a comfortable stunning interior. With as much attention to detail as is possible and all the amenities one could need in a relaxing environment, this property is the place for you. As you walk through the property, your breath will be taken away by the impeccable interior design - making a relaxing and functional haven for up to 8 people in 4 bedrooms. Once you've experienced sitting on your wide terrace, overlooking the azure waters with a glass of local wine in your hand, you won't ever want to leave. White grand piano for tinkling the ivories as you gaze across the ocean. Bar with piano, white leather sofas and pink cushions. sweeping view across the bay to Nice. - Double queen size + satellite TV. En suite. Electric shutters. - Double - up a ladder to a mezzanine area with very low bed. Ideal for kids. - Double - two x singles. TV. - Double + en-suite. Master suite with windows and fabulous views on two sides towards Nice and Italy. Also has ladder to mezzanine area with mattress suitble for two children. - Double queen size. TV. En suite. This room is wheelchair accessible although it's quite tight inside. There is a big blind which can offer shade on the hottest days. If there is a strong breeze, then the property manager will out up screens around the terrace to act as windbreaks. Small pets accepted. Please enquire with SFHV for more information. If mezzanine floors are used then this property can accept 12 people maximum. Please note that the pool is very small but there is a counter-current system which enables endless swimming. Otherwise, just walk 20 paces into the sea! 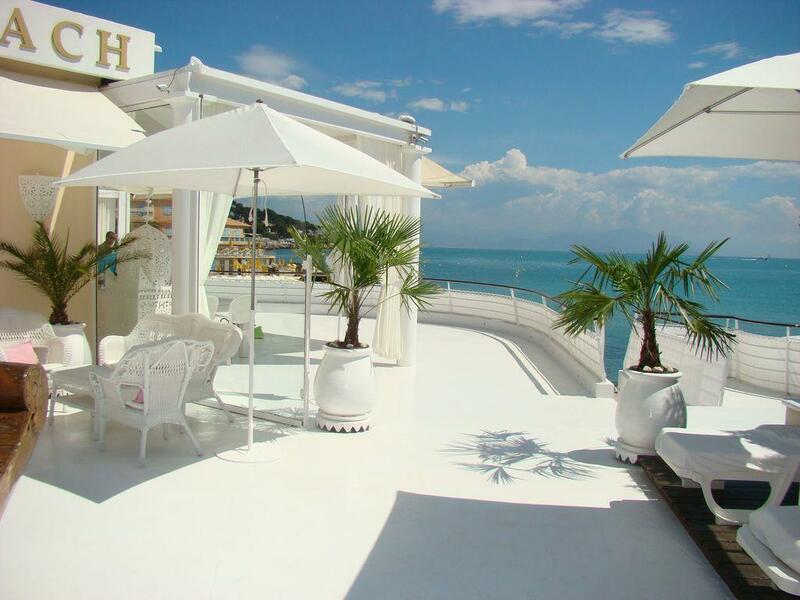 La Garoupe beach is what you expect when you close your eyes and think luxury wedding venue on the French riviera. The Villa is a unique seaside venue, surrounded on all sides by the shimmering Mediterranean sea and spectacular panoramic views as far as the French Alps. You can be assured of perfect privacy at this relaxing venue. The large terrace offers space for a seated dinner for up to 120 guests, a standup cocktail party can be hosted for up to 200 guests. Direct access by sea is possible using the dock 200 meters away. Your guests can enjoy a large choice of water sports on the Cap. Up to eight people can sleep in the venue during the event and your wedding guests will find plenty of quality hotels nearby. The unique layout of La Garoupe also provides a splendid venue for business events and incentives: cocktail evenings, dinners, marketing presentations, seminars and incentives. The villa also has the capacity for different or unusual formats, such as film or photographic shootings. You can moor your boat 100 m from the villa, so you will quickly be in Cannes and Monaco for the different festivals. Note that extra charges may apply when used as an event venue. No events may be held without prior notice to, and agreement of, the owners.